On Jan. 25 a representative of Moscow World Championships women's 10000 m 5th-placer Hitomi Niiya (25, Team Universal Entertainment) announced Niiya's retirement. A press conference to explain the decision is scheduled for Jan. 31. Born in Okayama, as a student at Kojokan H.S. she won her stage at the National High School Ekiden Championships three years in a row. 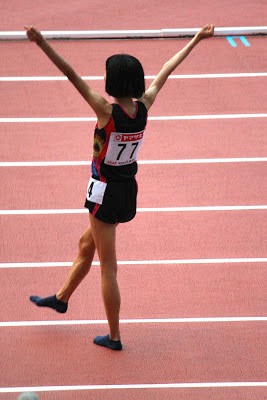 In 2006 she joined the Toyota Jidoshoki corporate team, and the following year at age 18 won the first Tokyo Marathon. In 2011 she left Toyota Jidoshokki to remain with coach Yoshio Koide when the team moved from Chiba to Aichi, qualifying as an independent for the Daegu World Championships where she made the final in the 5000 m. After joining the Universal Entertainment team she won the 2012 National Championships 5000 m, and at the London Olympics she was 9th in the 10000 m after leading much of the race. She lapped the entire field to set a meet record in the 10000 m at the 2013 National Championships before leading almost all the way in Moscow and taking 5th in a PB 30:56.70. After Moscow she injured the sole of her right foot and has not raced again. Translator's note: In a tearful interview immediately after her race in Moscow Niiya said, "I feel like there's no reason for me to be here. There's no reason to be at Worlds if you can't medal." Not long afterwards on her now-deleted Twitter account she said, "I think this race might have killed my career." This breaks my heart. I hope she finds strength in running again ,and if that takes getting away from the publicity of racing, then that's what she should do. I agree. She is too young to quit. She should take some time, even if its a year, and get back to running injury free. Even if she has to leave her professional running life and join an amatuer club. But that might be hard to do.